Not really. 'Cuz, I've been sewing all my life. My first sewing machine, a pink Sew Big, was a child sized machine that you cranked by hand. That was the third grade. By the fourth grade I had graduated to a "real" secondhand Kenmore. By the sixth, I had given up on teaching my mom to sew (she'd have to wake me up in the middle of the night to thread the machine for her) and was making my own clothes. Whenever I wasn't painting, I was sewing. I was flying high...I was born to sew. So when a client needed a master makeover and I needed a project for the CWTS finale, I jumped at the chance. After shopping for fabric and accessories, it was time to get down to business. My local quilt and fabric shop, the fabulous Lasting Creations, quilted the silk coverlet for me in a rush. I can't thank them enough. It's gorgeous -- pictures do not do it justice. I wanted to cover the round table in the unexpected and I think I got my wish. It's big, and stands up nicely to the canopy. That's a down foot warmer at the foot of the bed. Cool, huh? So, after four looooooong days (and nights) I'm happy to say I'm pleased with the results and so is my client. Lindy, it all looks wonderful. I just love the toile fabric! Oh! I love the coloured toile fabric. Ces't magnifique! Great job....now rest! That's beautiful; I love it!! Well Done! What a beautiful room!!! I would love to have just a smidge of your talents! Keep up the fab-0 job! Wow! This is gorgeous; wish I could do that!!!!! this is beautiful Lindy...I don't know how you could have accomplished all of this in four days ~ you are amazing! You did a marvelous job on this room! It's really beautiful! So sorry you didn't win but you're still an amazingly talented lady! The room is just beautiful. All of the little details really make it come together. Lindy...this room is amazing...you really have skills, girl! That bed stopped me in my tracks. I mean one of the most gorgeous things I have seen in a very long time! 3rd place still rocks... and the room is BEAUTIFUL! Great job! That canopy is so gorgeous, lovely room and lovely job! That bedroom is INSANE and the fact that you did it in FOUR days is even crazier! You did such a beautiful job and such great projects throughout the entire competition. Thanks so much for being part of Season 2!! I really like it! I am in the middle of a re-do with a friend of mine that is themed similarly! Its on my blog. I love what you have done! AMAZING!!! I love the fabric, I love it all! it's gorgeous. I would love it if you shared it at my party. I've been a follower of yours for a while, great blog. You did a fabulous job!! I want this room:o) Congratulations for making it as far as you did! You deserved it!! Love that toile Lindy...care to share manufacturer, pattern name...whatever?? I think you did a fabulous job, and if your friend is happy, that is what matters most. I loved the bedroom (voted for it), and am thinking of doing something similar in my bedroom... I have the four-poster bed, I just don't like the way I'd have to position the bed. Still thinking about it, but thank you for the inspiration! I love this bedroom!! What a wonderful job you did with decorating. Your sewing skills are amazing, I hope my skills get as good as yours. I am just a beginner sewer. But again, I love that room! 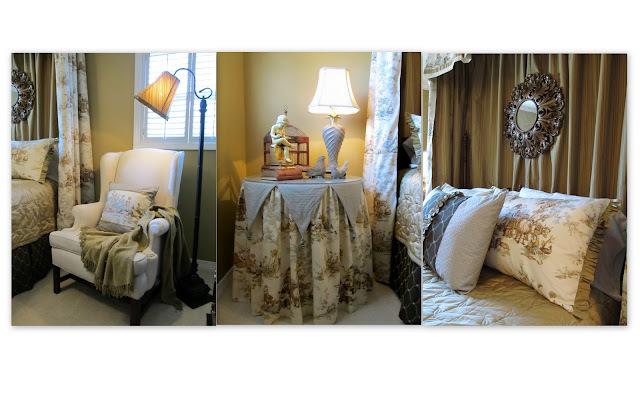 Can you share a tutorial on the beautiful canopy and fabric behind the bed? Beautiful Lindy! Love the fabrics! Gorgeous fabric, Lindy. Lucky client! Lindy this room is totally amazing and you should have won. That bean mosaic thing was awful. Well your top of my list. Have a great rest, you deserve it. Stuning!!! you are so talented!!! I'm sorry that you did not win but this IS a lot of sewing and you did a fabulous job. Love this look and love toile. Your room is gorgeous - what a beautiful retreat! Wow! What a transformation. Great job! You really did an amazing job. What a transformation. I am a follower. I would love for you to come and follow me back at www.diybydesign.blogspot.com. Thanks so much. I really thought you should have won 1st place. I love the headboard/canopy the mirror is a perfect accent. I know your client thought you were #1 and thats what matters! Great Job! Wow! It's a stunner! I'm loving the color and your table style is dressy but not too frilly--just the way I like it. Beautiful work! That is gorgeous!!! You did a super job on it. I sew and have for many years, but I do'nt love it like you obviously do. I wish I did! What a great job you did in that room! You have an amazing talent!! That is beautiful. I love everything about it. Wow, I am sorry you didn't win the contest but you are still a winner! What a GORGEOUS room. You have GOT to be proud! I'm a new follower just because of the contest and I am sure many others are as well. Can't wait to see what you do next! 4 days! You are fabulous. I love it. The fabrics are to die for. This is so my style. (my hubby might not like the abundance of fabric surrounding the bed, but a wonderful job. This Master bed room is fabulous. Thanks for sharing. Just because you didn't take first place in the contest doesn't mean your makeover isn't first class. You did a fabulous job, Lindy, and I have no doubt your client is thrilled! Well, Lindy, you got my vote! I LOVE that makeover! What a scrumptious bedroom! So elegant and cozy too! Thanks for sharing and enjoy your weekend. WOW! Gorgeous makeover Lindy! What a beautiful bedroom you've created. Your skills are exceptional!!!! That is an AMAZING makeover! It's crazy how pretty it is. That room could easily be on the cover of House Beautiful or any home decorating magazine! Oh boy, this is a luscious, gorgeous bed ensemble. You are truly talented and courageous!!! I love the round side table table top with the points...fab! Anyway, know that you have fans who envy your abilities! Truly unbelievable!! What a lucky client! Lindy that transformation is AMAZING!!! You should have won!!! This room is so fabulous and that you did it so quickly, makes it over-the-top awesome. What a beautiful transformation! I love all the pretty details. you did all of that in four days? wow that is amazing as well as totally beautiful. Hi Lindy...can't believe you did all this in 4 days. I found you At The Picket Fence and I'm following you now. Do you mind sharing how you made the down foot warmer? Can you just buy them and make a cover? I think that's my favorite element in the room but it's a hard choice! Nice to meet you. Wow, Lindy! It's stunning! As soon as you're rested up, can we discuss my master bedroom?! Just kidding...but seriously - great job. It's a beautiful room from top to bottom! Hi. This master bedroom is beautiful! Of course, I love TOILE, and I just did a post about it. Gorgeous! Absolutely Gorgeous! Magazine worthy! I could just move right in! :-) Thank you so much for linking this up to Inspiration Friday! How did you hang the mirror outside the curtain like that? Wow Lindy, what a stunning room!!! Every bit of it is gorgeous!! You are so amazingly talented, I just love seeing what you do! You did an outstanding job! I am your new follower. Can't wait to check out the rest of your blog. Have a great week! The bedroom is really beautiful and so soothing to the eye. The canopy over the bed is stunning and I like the mirror you chose to hang above the bed. .....a very lovely room. That curtain stands out from the wall a couple of inches because it's on a tension rod in front of crown molding. I screwed a 24" piece of 2x4 to wall, vertically, behind the curtain and I just nailed a picture hanger right through it! The foot warmer was a messy job. I took two standard size down pillows and cut one end off of each. I removed about 1/4 to 1/3 of the feathers out of each ( I wanted a little flatter look) and mashed the rest of the feathers to the bottom of the pillow so I could hand stitch the two open ends together. Then I fluffed it all back up. This was the messiest job I've ever done. There were feathers everywhere -- I'm still finding them! What an amazing transformation! :) Thanks for linking up!! Wow! Just beautiful! Found you through Cielo's site. I can't believe you didn't win first place! I just love that toile fabric. And the quilting on that comforter is beautiful work. I also love to sew but don't think I could ever tackle something like this. Talk about a difference with every detail being just right. Your client must be delighted to have such a beautiful retreat. WOW Lindy, you did a beautiful job! I have enjoyed my visit and have become one of your newest followers. Clearly, you've done yourself proud. Congrats on the project! Wow, that is beautiful! The talent is just oozing from this post. I've never even seen a foot warmer before! I got a lot of ideas for my own room. Gorgeous!! Holy smokes I'm loving your headboard and canopy. It's to-die-for! I love that canopy! You made a wonderful room for your client. They must love it! Where oh where did that mirror above the bed come from?! I want it so bad. What a gorgeous piece. The whole room came together so well. You are amazing Lindy. omg can you please please redo my bedroom as well??? Can't imagine why you didn't win! Love this bedroom and the details - love, love,love, the down foot warmer! This is my first visit to your blog. I found you thru Wow Us Wednesday. 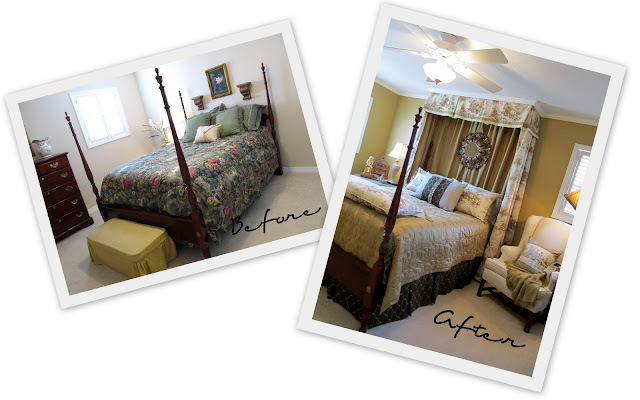 Your bedroom make over is fantastic. I'm your newest follower. Would love a follow back. Lindy, What a gorgeous room! Your talent really shines here. This turned out great, I'm a sucker for toile ! I love the way you mixed the fabrics and all the small details really make a big impact. What an amazing transformation...just Beautiful!! LOVE IT! Gorgeous. I wish I could sew like that. Lindy, this room is fabulous!!! Did you choose all the fabric. I love this makeover. You are sooooooo talented, girl. I wish I could sew like that. It is so good that you started so young. Artist and seamstress. Wow! I love that toile pattern. Is it blues and browns in it? I may hit you up for two custom orders later if you do those. Thanks so much for adding my link to your post!! Hi, gorgeous room! What is the name of the new paint color? I will be featuring you this week on "Amaze Me Monday" blog party. Thanks for linking up! I love the room! I have purchased fabric and am about to do a similar project to our master bedroom. Can you tell me how you installed the fabric around the bed? I was thinking about doing a box form and attaching the fabric to it. Do you have a better way? You are so talented. I believe sewing to be an art. I've tried so many times to master it and all I can do is sew a straight line. I featured you this week in my Hookin Up with HoH party! Feel free to stop by and grab a button. You earned it! Magazine worthy! What a stunning room you've created. I love everything about it. It's such a soothing color. LOVE the toile! Gorgeous! It reminds me of a bed and breakfast. :o) I am now seriously considering trying a canopy like that. It really takes it up a notch. Awesome job! This is absolutely gorgeous beyond words! Is it possible for you to share the brand and name of the fabric? I've never seen a green like this and a soft blue together and I'd like to incorporate light blues in my green decor. I love the fabric behind the headboard. I have a very similar bed and I am wondering how much fabric you used. Gorgeous! I think your hard-work paid off with all the wonderful comments from your reader :) The output is gorgeous. I love the fabric that you chose and the mirror is beautiful. Great job! I absolutely LOVE what you did here!